Among the popular options in the Gold Chinese Panda coinage is the ¼ oz coin. The Gold Panda is issued annually by the Chinese Mint and features a new reverse design of the Giant Panda species with each new release. Today, ¼ oz Gold Chinese Panda Coins are available to you online at Silver.com. Ships to you inside of protective flip! Struck by the Chinese Mint from 1982 to 2015! Consists of One-Quarter Troy ounce of .999 fine gold. The face value of ¥25 or 100 (Yuan) is fully backed by the People’s Republic of China. Obverse side of the coin includes the Hall of Prayer for Abundant Harvests. Reverse face of the coin features the depiction of the Giant Panda. Gold Chinese Panda coins are available annually in five different weights. The 1 oz gold coin and three of the fractional weights debuted in 1982. In 1983, the Chinese Mint expanded its offering to include a 1/20 oz gold coin. 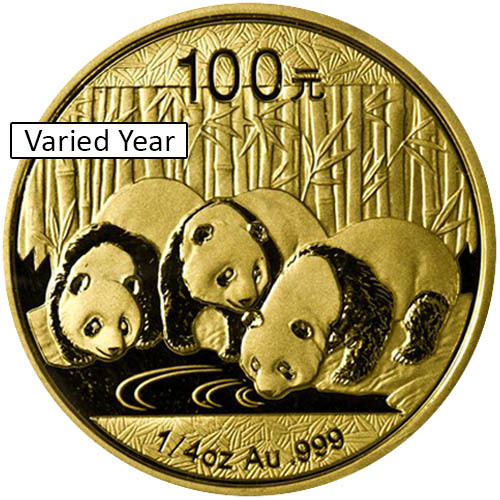 These ¼ oz Gold Chinese Pandas are available to you from varied years of issue stretching from 1982 to 2015. All ¼ oz Gold Chinese Panda Coins in this listing have been unsealed from their original Chinese Mint packaging, but are still available to you in protective packaging to ensure their condition during shipment. Silver.com cannot guarantee a specific year of issue or design with the ¼ oz Gold Panda coin you purchase. The coins will be chosen from our warehouse at the time your order is processed and this determines the coin you receive. The ¼ oz Gold Chinese Panda coins in this listing come with one of two different face values. From their introduction in 1982 until 2000, the Chinese Mint issued ¼ oz Gold Panda coins with a face value of 25 Yuan. From 2001 until 2015, the Chinese Mint issued a new face value of 100 Yuan on the coins. There was no change in the weight or purity of the gold, however. On the reverse of the ¼ oz Gold Chinese Panda Coin, you’ll find a depiction of the Giant Panda. 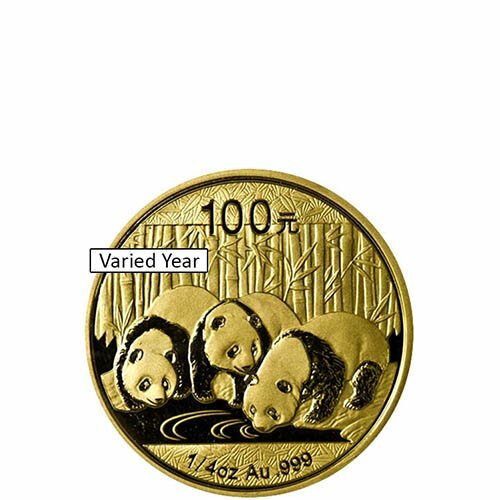 The mint uses a new design each year which may include a single cub, a single adult, two adult pandas, or even a mother and cub. The obverse of ¼ oz Gold Panda coins always features the Temple of Heaven complex. This side of the coin also includes engravings in Mandarin Chinese that read “The People’s Republic of China” and the year of issue.